There is something so sweet, feminine, and old-fashioned about paper lace doilies, don’t you think? Maybe it reminds me of making Valentines as a child, or special occasions like having high tea. So in my recent obsessions explorations on Pinterest, I’ve been inspired by some of the doily crafts I’ve collected on my pinboard, like this beautiful garland of painted doilies (credit to Meg Duerkson and Pink & Green Mama) and this example of stenciling with doilies. A few weeks ago I decided to experiment using some of these ideas with my arts & crafts group. I thought the ladies would enjoy trying some new ways to use watercolor (a very familiar medium for our group) and stenciling techniques. As always, we learned as we went about what works best for us. At first I tried taping down some watercolor paper to secure it to the table, and then taping down 1 or 2 doilies on the paper (warning: white doily on white watercolor paper can be hard for older eyes to see!). I offered watercolors (I prefer the more saturated colors in these Pelikan gouache sets), a good flat brush or stencil brush, and demonstrated how to tap onto the lace of the doily to stencil it onto the paper. It’s important to paint all around the perimeter of the doily’s edge to get a well defined shape. After applying the desired amount of paint (be careful to not saturate the doily with too much water or you’ll have too much bleed-through), carefully peel off the doily for the grand “reveal” beneath. 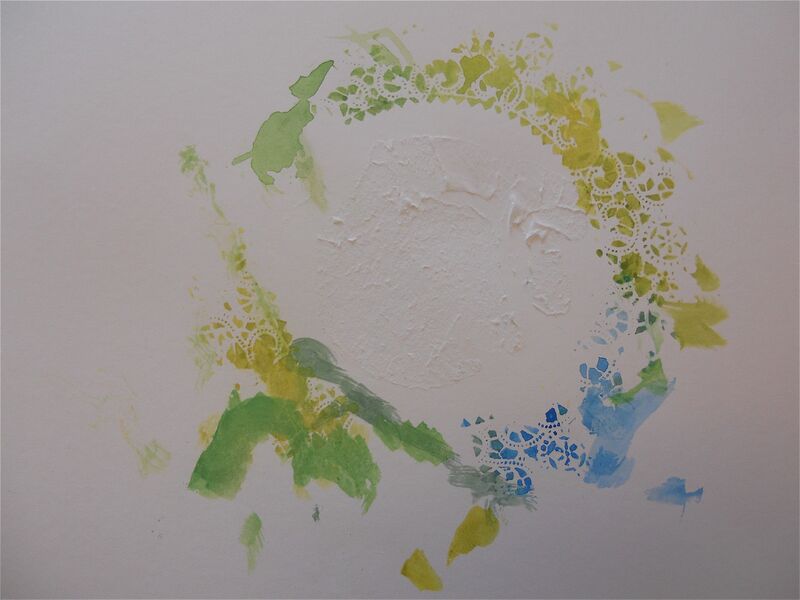 This artist had some difficulty with the process, but with some help she was able to apply enough paint to get a partial stencilling effect from the doily. This woman has severe cognitive loss, is mostly aphasic (little to no verbal communication, but seems to understand some verbal speech), and has limited motor abilities. (She has a kind of frozen quality, but the warmth and sparkle of her quiet eyes suggest a radiant presence within.) A brush loaded with color was gently placed in her hand, and then her hand was guided to the paper. She was then able to create this beautiful piece. To me, the fragmented quality of this image has a certain poignancy that reflects the parts of her that have been lost in the dementia process…yet the pieces that remain are still vibrant and colorful. The stencilling technique was difficult and frustrating for some, and took just a few minutes, so then we switched gears to try this approach. I invited the ladies to try painting the doilies themselves. So we had an experience of painting the negative space with the stenciling technique, and then shifting perspective by painting the positive space (the doily itself). This was much easier and rewarding for the ladies who struggled with the stencilling approach. We didn’t make enough for a garland, so instead I made their doilies into flowers like this (with their permission). 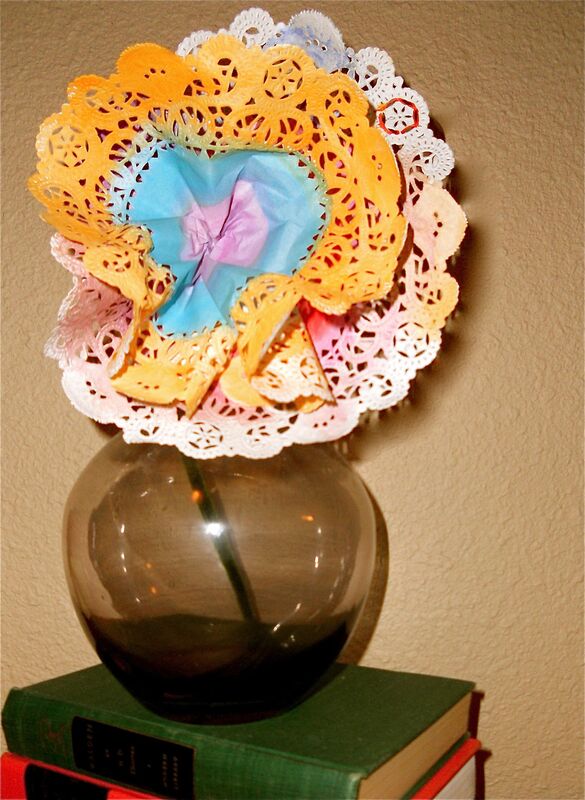 Just take 2 doilies and pinch each one in the center to form a ruffled flower shape. Layer them together, one over the other (like you would for a tissue paper flower), then use a pipe cleaner to secure them in the back and form a stem. The doilies were a surprisingly versatile material to work with, allowing us to adapt to the needs of each individual. Some responded very well to the stencilling approach and were delighted by the experience of pulling off the doily to reveal the pattern beneath. There seems to be something magical (and metaphorical?) about pulling off a layer to reveal something that was hidden beneath. And there is also the experience of “ruining” the doily itself as it is pulled off, offering a little experience of letting go of one form to find something even more precious revealed. This process of letting go is such a central theme for many people at the end of life, and the grace with which one is able to let go often determines how peaceful one can be. Amazing how the art process and the use of art materials can mimic these themes of living, dying, letting go, creating, and transforming. This wasn’t discussed directly in the group, as I prefer to let the artwork itself hold the metaphor, instead of confronting people with something they may not be comfortable discussing. I just follow the lead of the artists themselves; if they bring up a topic I am willing to “go there,” otherwise I don’t force this kind of heavy conversation upon them. For others, this stenciling process was frustrating and produced some anxiety. 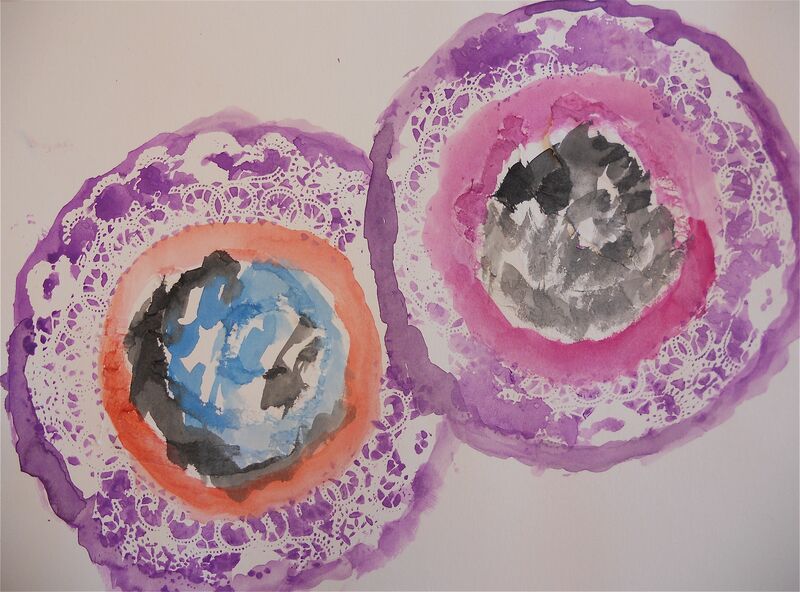 Painting the doilies themselves with color was a much more concrete and straight-forward directive to grasp. There was no mystery or anxiety about what was underneath. For one artist, it seemed that she needed to see exactly what was happening and not have to wonder if she was “doing it right.” So the versatility of the doily as art material offered her this more reassuring experience, which resulted in a concrete object: the doily flower. 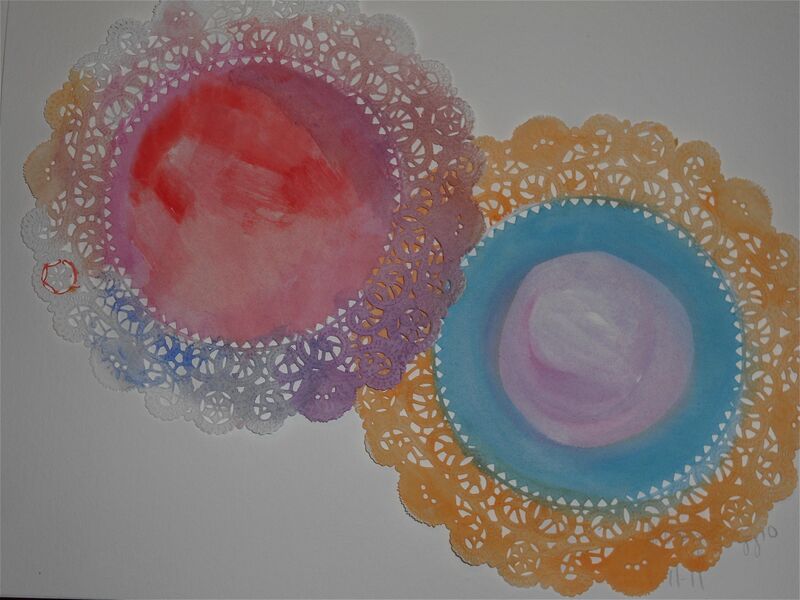 Have you ever used doilies or lace in your art or with a group? What has your experience been? With the lavender in our facility’s garden in full bloom, it seemed like the perfect time to harvest and make some dream-pillows…and for a little foray into horticultural therapy. Not that I’m a horticultural therapist. I just like gardens and flowers a lot. Art therapy, being about cycles of creativity and growth, seems to have a lot in common with gardening and horticultural therapy. You can simply lay the cut stalks of lavender on a tray or plate and leave it to dry out on your kitchen counter for a few days. Since I didn’t have time to do this, I cut the stalks that already looked a bit dry. And since lavender has natural anti-bacterial and anti-microbial properties, I figured it wouldn’t be a big deal to use some fresh flowers. 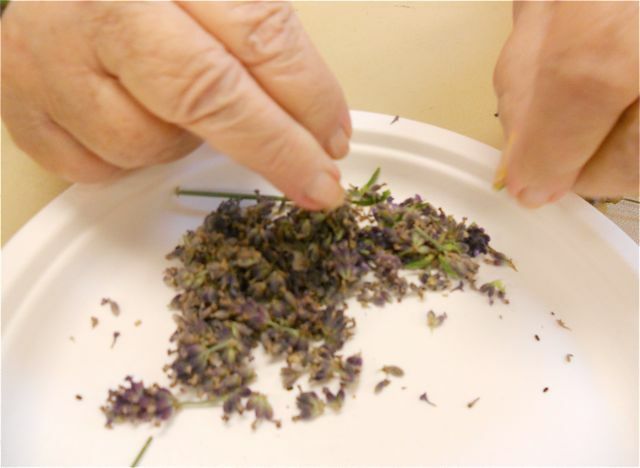 When I gathered my group of ladies for our arts and crafts group, I gave each of them a paper plate and a small bunch of lavender stems, and showed them how to pull the buds from the stalks by simply running their fingers down the stem. Not only did we enjoy the natural aromatherapy of stripping the flowers from the stem, it also offered an opportunity for using fine motor skills and gentle movement for stiff fingers. We talked about memories of gardens and herbs, and how lavender has been used for ages as an herb for beauty, health, and relaxation. 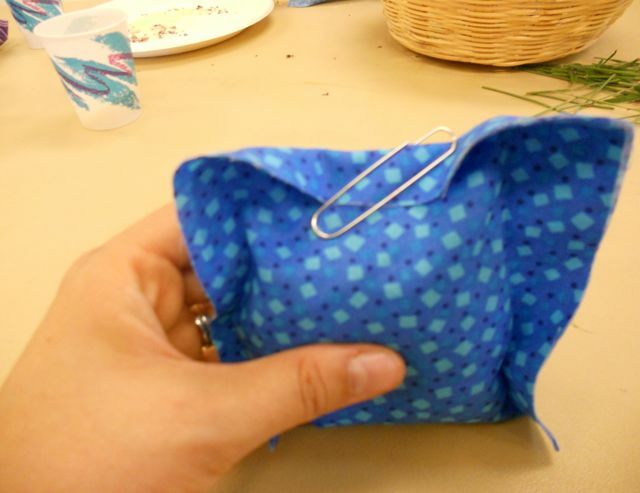 After they each had a pile of lavender, I invited them to pick out a little bag I had pre-assembled using scraps of fabric and some iron-on “stitch-witchery” that I used to hem 3 sides of the bag. These fabric squares measure about 6 inches square, but once you hem them with the stitch-witchery, the inside space probably measures 5 x 5 inches. I decided to make these bean-bag size so they could be grasped easily in one hand. Anything larger I thought might be overwhelming for these individuals to work with. Always trying to promote “success” in this group and not overwhelm with something too daunting! Once it was full, I used a paper clip to close the top temporarily, and then sealed the opening with more iron-on stitch-witchery. Then I popped all the dream-pillows in the microwave for 20 seconds so we could enjoy the heavenly scent of fresh lavender and a gentle hot-pack, thanks to the heat retaining properties of the rice. Wonderful sensory stimulation all around! Scent, warmth, and tactile stimulation! This all took maybe half an hour, so we each made a second one to give to a friend. They seemed to like that they made something functional. One lady was excited to put it to use in her dresser drawers, while another who is always cold liked having it to warm her hands. As for the therapeutic rationale, this project is great for sensory stimulation, gently exercising stiff hands, maintaining fine motor skills, and stimulating memories of gardens and herbs through the sense of smell. It touches on cognitive skills by learning about the history and uses of lavender, and results in a simple but lovely product that can be enjoyed and shared with others. I also love any projects that tie in with what’s going on in our garden, because it seems to connect us to the natural cycles in the world around us…and makes living in a skilled nursing center less institutional and a little more natural. What kinds of projects is your garden inspiring for you? Did I fool you into thinking I could actually sew? This little 5 inch square is made of paper mosaic pieces that can be easily pieced and glued together into a “mini-quilt.” I recently tried out this awesome little “quilting” project with 2 arts and crafts groups at the nursing home where I work, and it went over well with the ladies in both groups (a “higher functioning” group and a group on our memory care unit). The materials came from this kit I purchased a while ago from an activity catalog, but you can purchase them here. 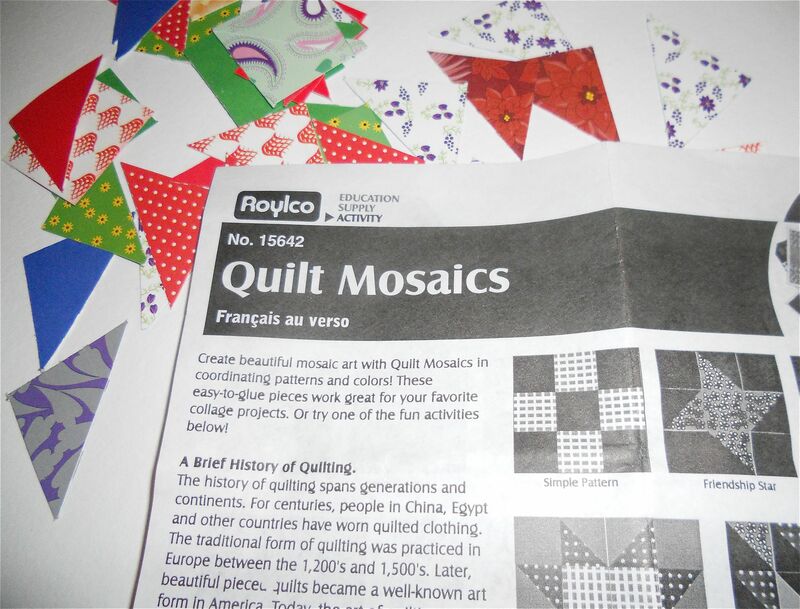 Or I suppose you could cut a zillion little triangles and squares from paper scraps or wallpaper sample books, which might be a good project for one of your clients who enjoys this kind of work. 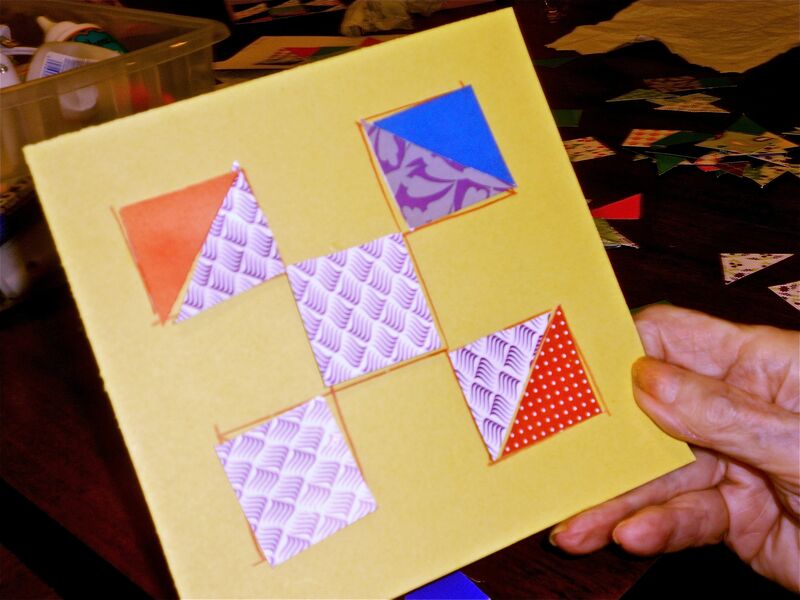 I would suggest pre-cutting squares of construction paper ahead of time to use as a base for building your paper quilt. 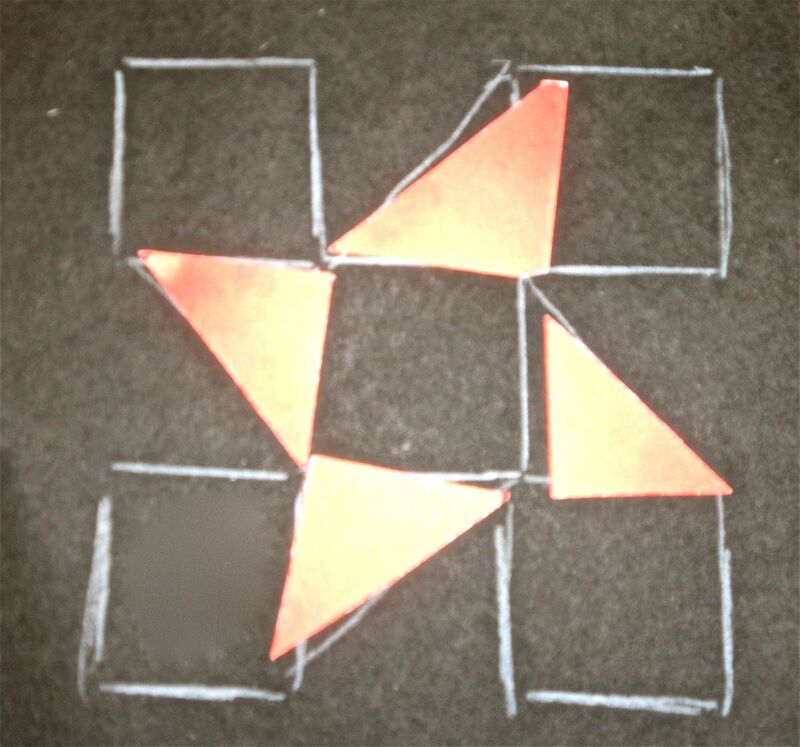 I like the way these brightly colored geometric papers look on a piece of black paper, but for people with low-vision, I would recommend using a yellow paper (I’ve heard yellow is the easiest color to see). 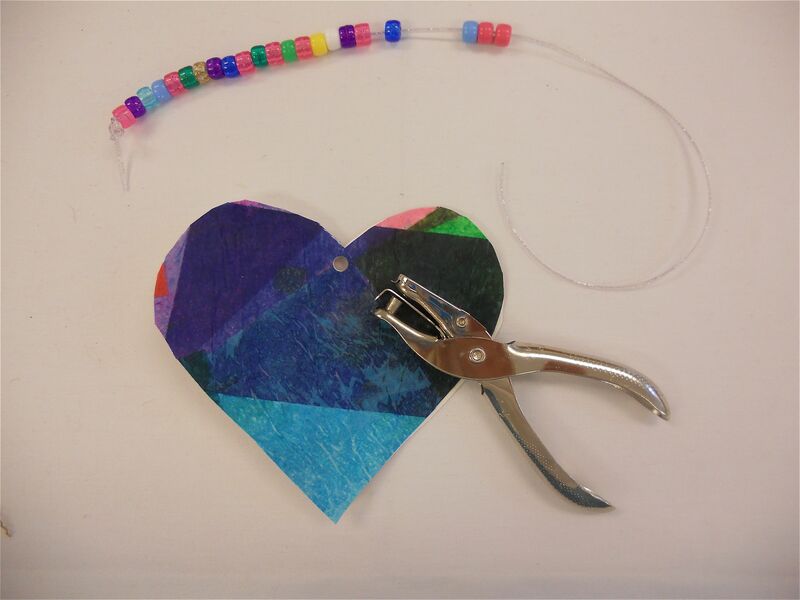 In my “higher functioning group,” I showed them the example above, explained the process, and gave them them a glue stick and a pile of the mosaic paper scraps. While they all loved the fun colors and patterns and immediately got to work arranging them on paper, I was surprised at how difficult it was them for them to make an organized geometric pattern. The one on the left was created by a woman who had suffered a stroke, leaving her with a visual neglect on her left-side. You can see an attempt at trying to create a geometric pattern, but its somewhat disordered (though lovely and free in its own way). 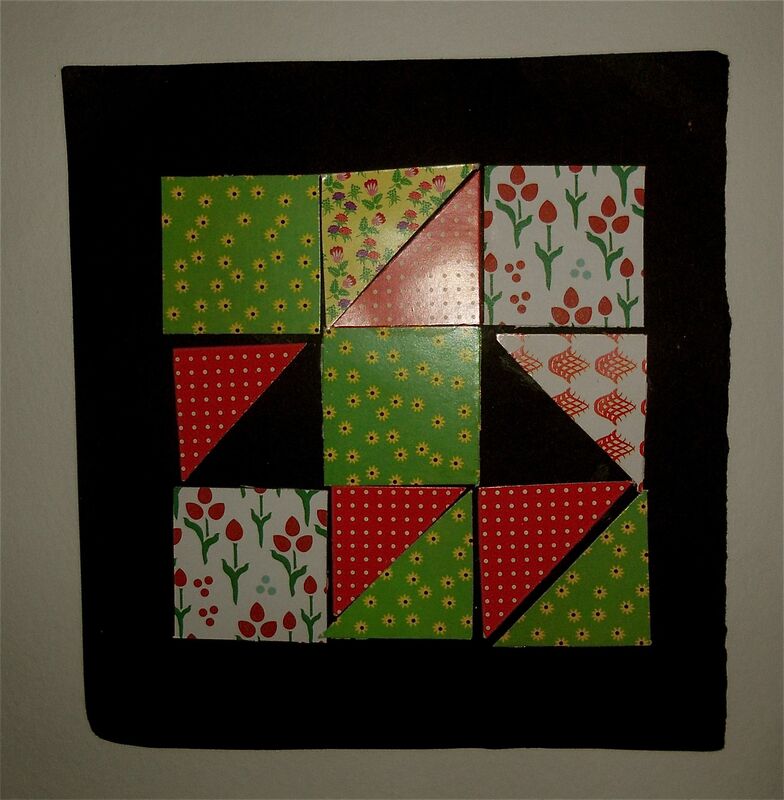 She was familiar with the art of quilting, having learned the art from her mother. So it was interesting to see how her stroke may have impacted her sense of visual order. I helped her extensively with the row of alternating triangles on the right. 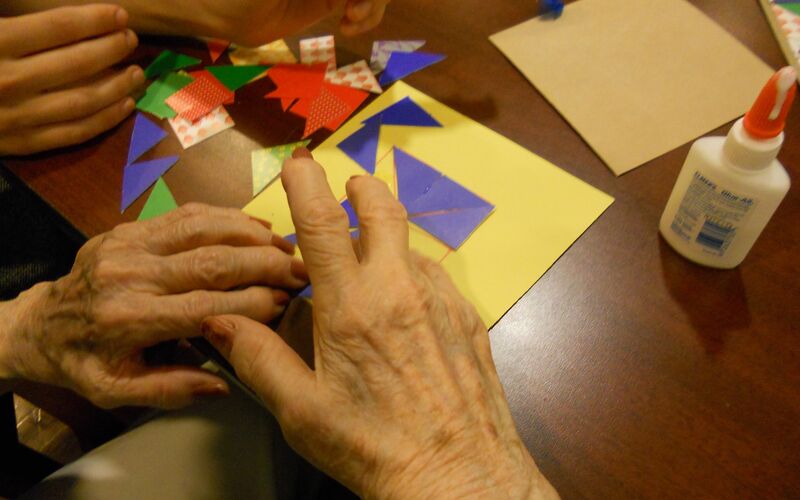 Having learned something from this experience, I tried a more structured approach for the memory care group. 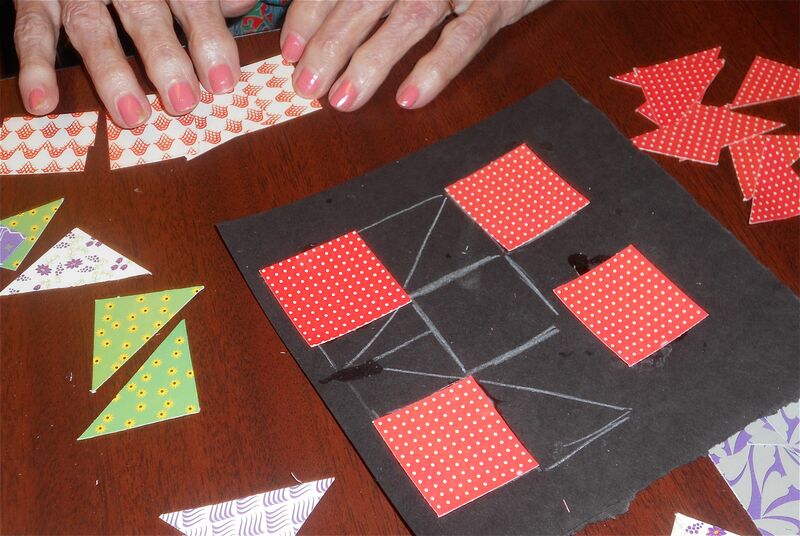 This time I used colored pencil to draw quilt patterns on the construction paper squares ahead of time, so the residents could place and glue the cut-out shapes according to a pre-drawn pattern. 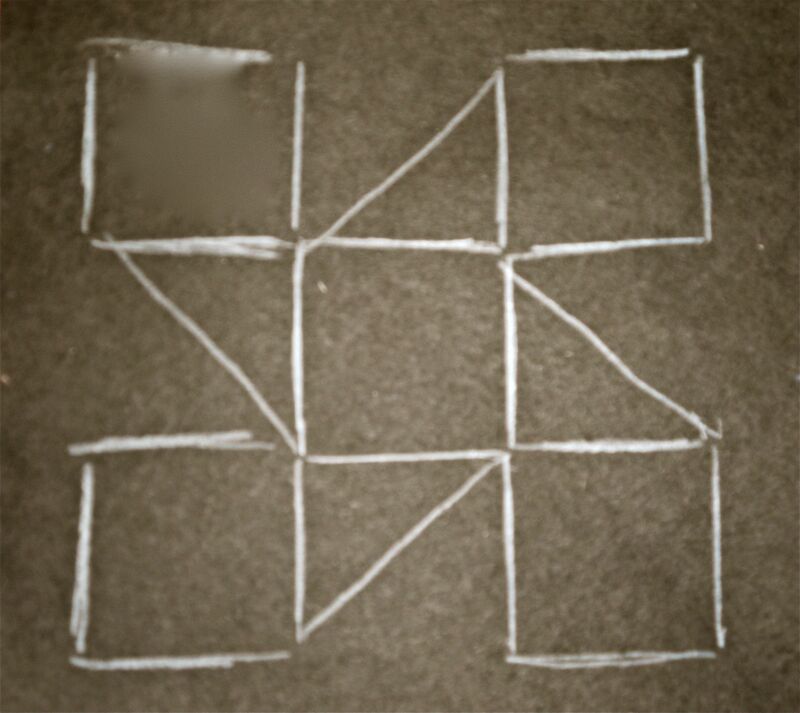 So here is a simple quilt pattern drawn in white pencil on a 6 inch square piece of black paper. 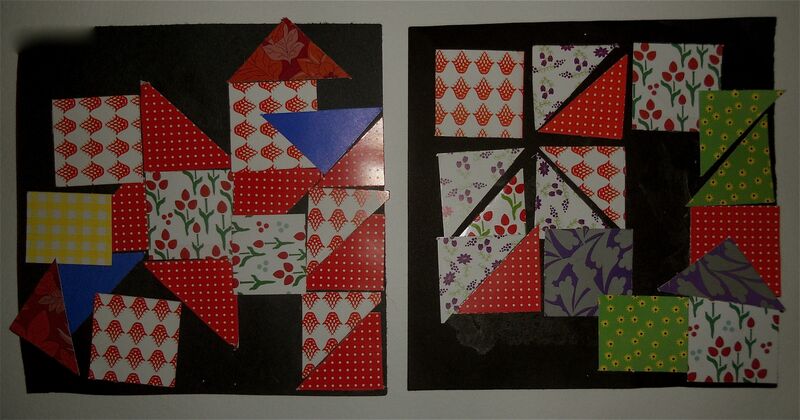 And here it is with some red triangles placed carefully by a woman with Alzheimer’s disease. 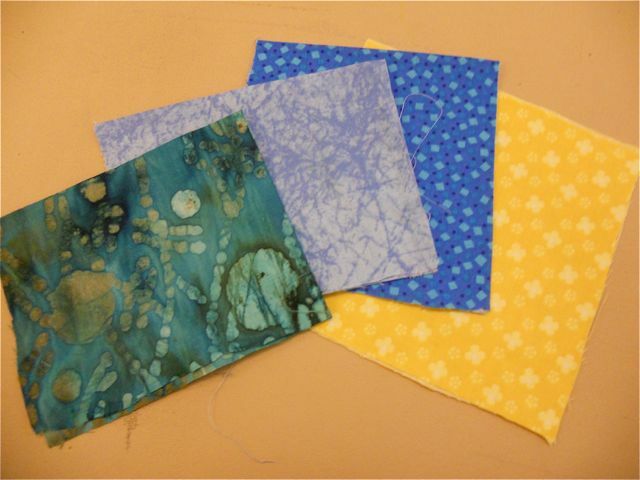 She used to sew a lot before she became ill.
Yellow paper worked better for this woman who has some vision loss. She loved moving the papers around and playing with different arrangements. Here’s a finished quilt using pre-drawn templates. The pre-drawn templates provided much-needed cueing and built-in structure for this group, but it also resulted in less visually dynamic work. Not only did this woman use the template to build an orderly pattern, she then carefully sorted a messy pile of papers according to color and pattern! The other group-facilitators and I were so impressed that this woman with profound memory loss would initiate such a challenging project and succeed! What a beautiful example of the natural ordering process of humans, that there is some drive within to create order out of chaos. Montessori education philosophies (which are now being applied to working with dementia patients, thanks to the Myers Research Institute) teach that a sense of order is a basic human need. As I think about it, setting up this project with pre-drawn templates is a very Montessori approach. 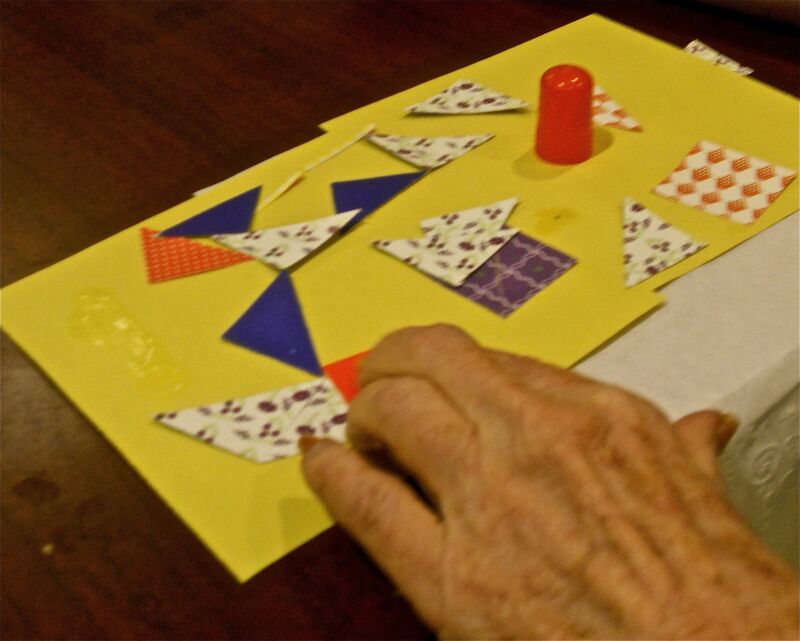 Click here to read more about using Montessori principles with seniors who have dementia. This book on using Montessori for dementia patients has also been incredibly helpful in designing activities that promote remaining strengths. I love this simple image; old hands that continue to create. My arts and crafts group recently did a little stamping. I thought it would be a simple project that would offer a high reward (ie: nice crisp images that could be made into something useful, like stationary). I liked the idea of making something functional like stationary, as I thought the ladies would enjoy sending little handmade notes they had created. 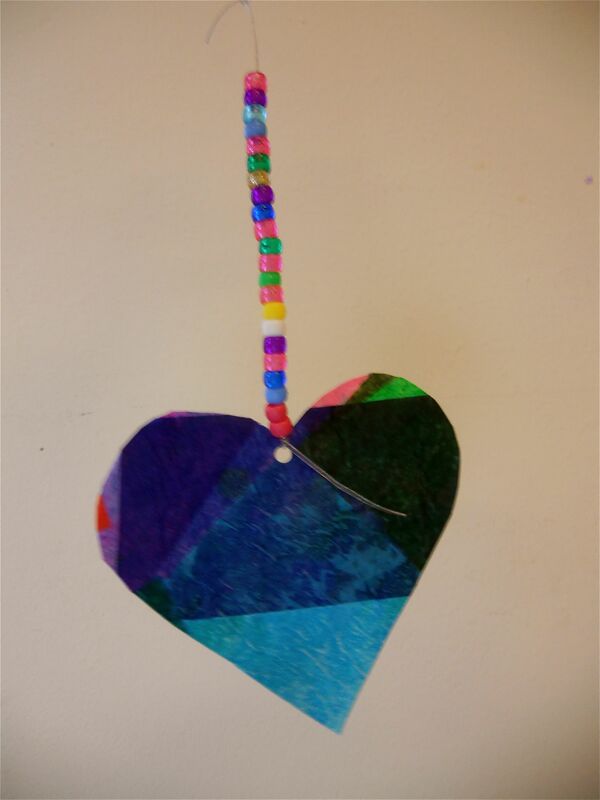 They seem to always enjoy making something with a purpose (like decorations for the halls, gifts for others, something we can sell at our arts & crafts fairs). It wasn’t quite as simple and straight-forward as I anticipated, so I’ll share what wrong and what went right with our experience. I brought in a bag full of various stamps and ink pads of rainbow colors and laid it all out on the table, along with a variety of colored construction paper, glue sticks, glitter, and craft scissors. 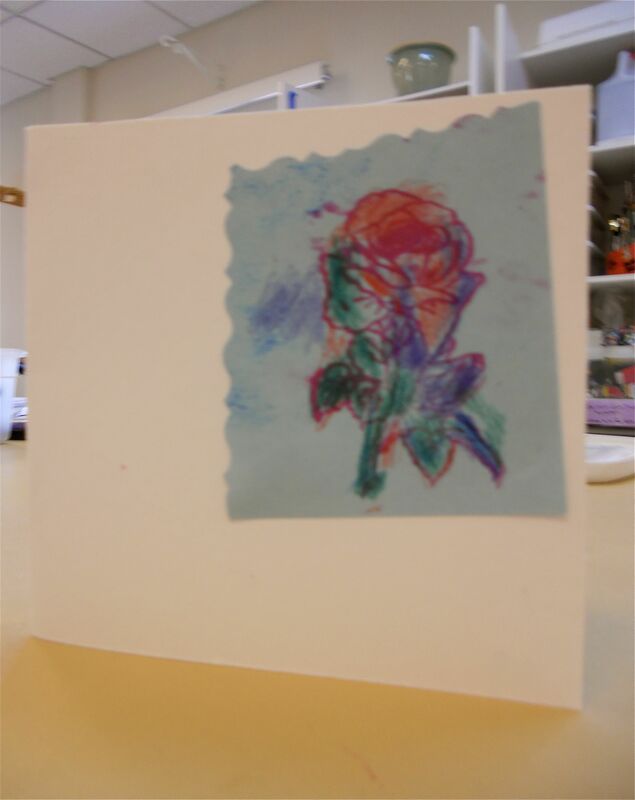 I explained and visually demonstrated the process of stamping. Pick your stamp, place it on the ink pad and press down, place it on your paper, press down, remove carefully. The picking out the stamp part went over well. Before we even started they figured out which stamp they wanted to claim. The other steps were a little trickier for them, and I wished I had some back-up to offer more one-on-one assistance with each of my 5 group members. The main issue was sequencing the steps and hand-strength: strength to rub the stamp into the ink-pad and pick up enough pigment for decent coverage, and strength to press the inked stamp onto the paper. They tried to follow my directions, but their efforts were not at first rewarded with the crisp images I had hoped for. The stamped images were incomplete, fuzzy, faded and smudgy. I felt like I had just set them up for failure. So I switched gears and gave them larger sheets of paper to “practice on.” I directed them to try making a lot of stamps on their paper, sometimes placing my hand over theirs to add a little more strength to transfer the ink. Once they had a bunch of stamp marks on their page, we picked out their favorites and I cut them out, while they glued them onto note cards (watercolor paper cut and folded) with a glue stick. This happy green turtle was embellished with some glitter glue tubes that I squeezed out according to the artist’s direction. Again, hand-strength was an issue. So I acted as her third hand and let the artist tell me where she wanted the glitter to go. I figured she had already struggled enough to produce this image and I didn’t want her to experience any more frustration in one afternoon. 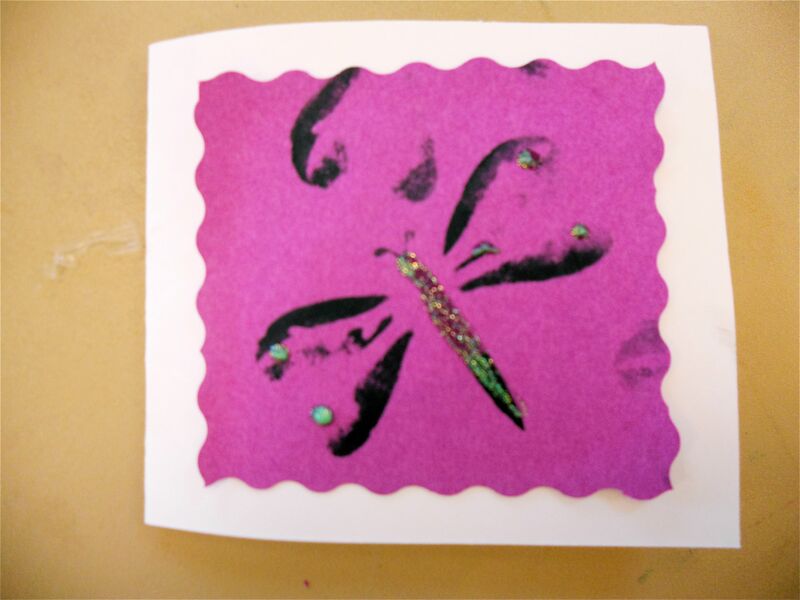 This artist loves dragonflies and was immediately drawn to using this stamp. But she had a lot of frustration getting the ink coverage she wanted, due to lethargy and overall weakness. But after practicing to get different effects, she was able to get a few prints she liked. I cut out this section from her paper (you can see pieces from other stamping attempts along the edges, which I really like) and she was so pleased with the result. Again, I applied the glitter glue of her choice according to her direction, and she glued the image onto the card-stock. She struggled hard to produce this one piece, but her smile of satisfaction at the end was real and well-deserved. Many of the folks I work with struggle with some pretty terrible illnesses of the brain and body. They are very aware of the abilities and freedoms they have lost; some are more able to adapt and keep up a positive attitude, while others sink into apathy and defeat. I realize more every day that I want to create art experiences that offer these people an experience of success. I want them to know that they can create something beautiful and useful, that they can make choices about what materials to use, and that they can use the materials to get the effect they want. My first approach to this stamping project was a narrow and product-oriented goal to make stationary; it was a sure set-up for failure. But shifting into a process-oriented exploration and stamping up a big sheet of paper actually yielded the result I was hoping they would achieve. You can start out with a goal or a direction for a project, but without the process exploration piece, there’s no way for people to make it their own. As this woman did, who embellished her print with colored pencils. These wonderful people are always teaching me how to become a better art therapist. What have your clients, students, or loved ones been teaching you lately? 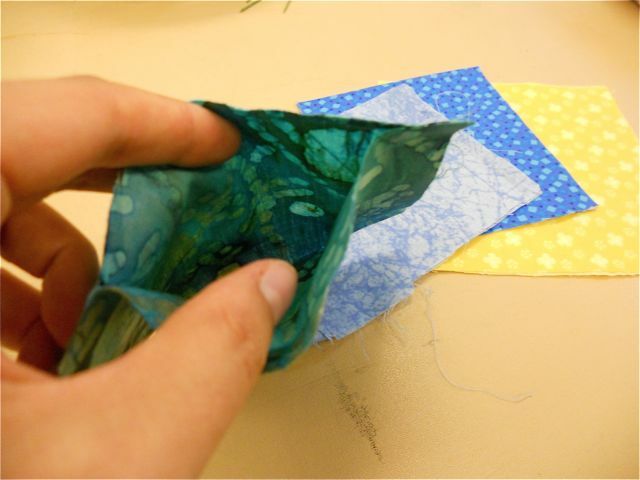 I love working with tissue paper; it’s by far one of the more versatile materials that I pull out time and again. From decoupaging on glass baby jars (sweet candle holders!) to your ubiquitous yet charming clothes-pin butterflies or flowers…there are soooo many possibilities. So here is a simple 2-3 session project that offers both a pleasant sensory exploration of color, as well as a pleasing product. I love when process and product come together like that. By the way, many of the projects I’ll be sharing here are appropriate for inter-generational groups with children. And many of the projects I use with seniors are inspired by some awesome blogs on doing art and art therapy with children (credit given of course to the authors). But when working with seniors only, I’m always careful to choose materials and projects that still come across as adult in nature. That can be tricky when you’re working with adults who have lost many of the abilities that previously defined their maturity. 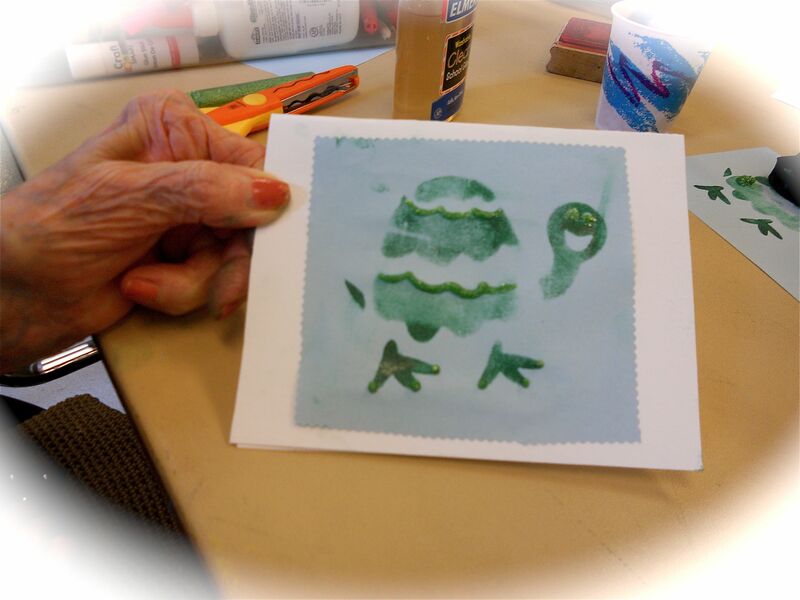 When an adult has lost the motor skills that allowed them to do finely detailed work, sometimes children’s art materials offer a larger scale or brighter colors that are easier for elderly eyes and hands to manage. It’s how one uses the materials that I think is important, in order to avoid infantilizing seniors. 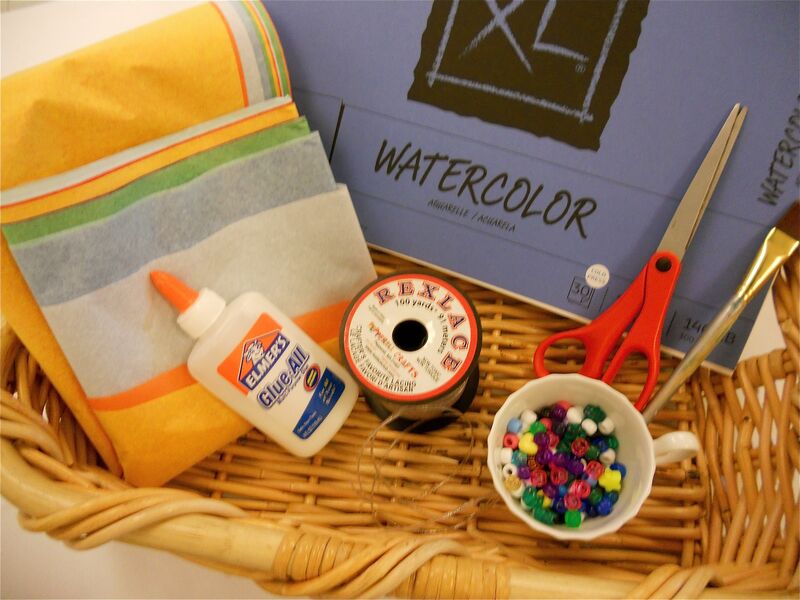 Variety pack of colored tissue paper, watercolor paper, scissors, a 1″ flat paintbrush, white glue, pony beads, blue painters tape, a handheld hole-puncher, some laminating sheets, and “rexlace” or some kind of stiff material for stringing beads. Start by mixing up a little white glue and water in some kind of plastic container or cup (2:1 ratio for those who like to measure). Start with less, you can always add more. Set out a piece of watercolor paper in front of the artist and tape down the edges with blue painters tape to secure the paper and define the visual boundary. 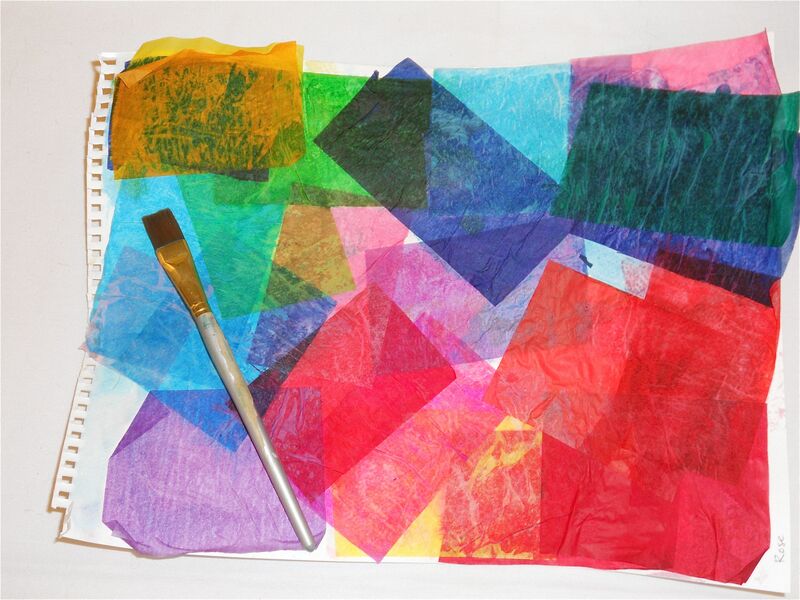 Demonstrate how to lay down a square of tissue paper on the watercolor paper, and gently brush the glue-water over the square, while then layering another square partly overlapping that, allowing the colors to layer and bleed through. You can talk about how the colors look together, how they mix to create new colors, what feelings or senses each color evokes. This phase has been more about process and enjoying an exploration of materials. The next phase of the project is more structured and product oriented, requiring a little more structure. Anyways, next you’ll want to cut a length of the “rexlace,” a nice stiff plasticky beading material. Maybe 12 inches or so… the length of the twine depends on the person and their abilities. Too long will be overwhelming for some, too short will be limiting for others. Tie off the end of the rexlace and set out a little plate or cup of colored pony beads for each person, and demonstrate stringing a few beads on before handing it to the artist to finish. 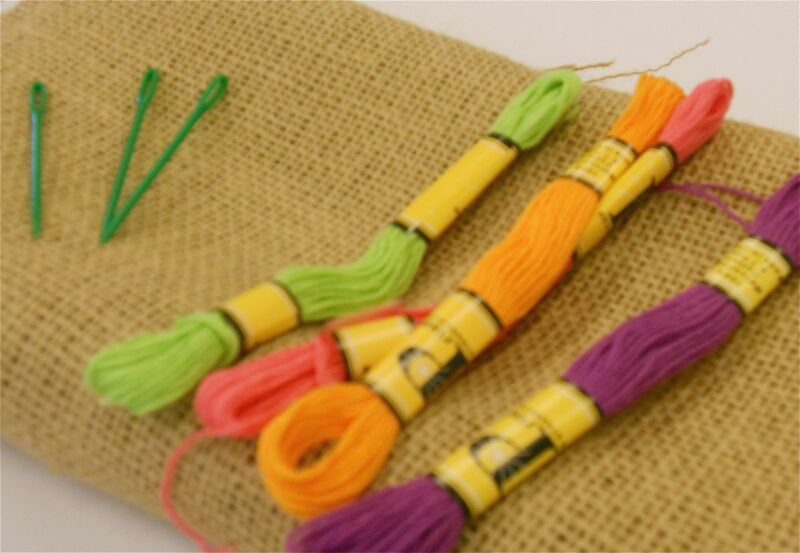 Tie on your beaded twine and its ready to hang and brighten a sunny window. 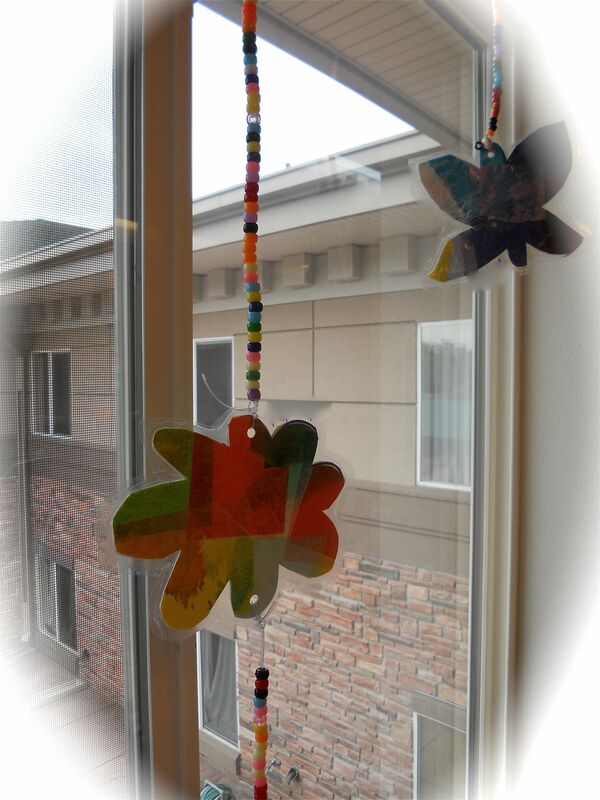 We hung ours up in our activity room windows to warm up the space as home-made seasonal decor. They make me happy when I look at them. Want to see them again? Ahhh…. Let me know if you try this with a group and how it works out! Let me begin this post by saying that I am not naturally gifted with a knack for using needle and thread. It’s one of those areas that I hope to someday become proficient in. I have dreams of sewing pillow covers and making cute skirts and dresses. But the few times I’ve attempted to use a sewing machine has resulted in a tangled mess. I really admire people who can sew. 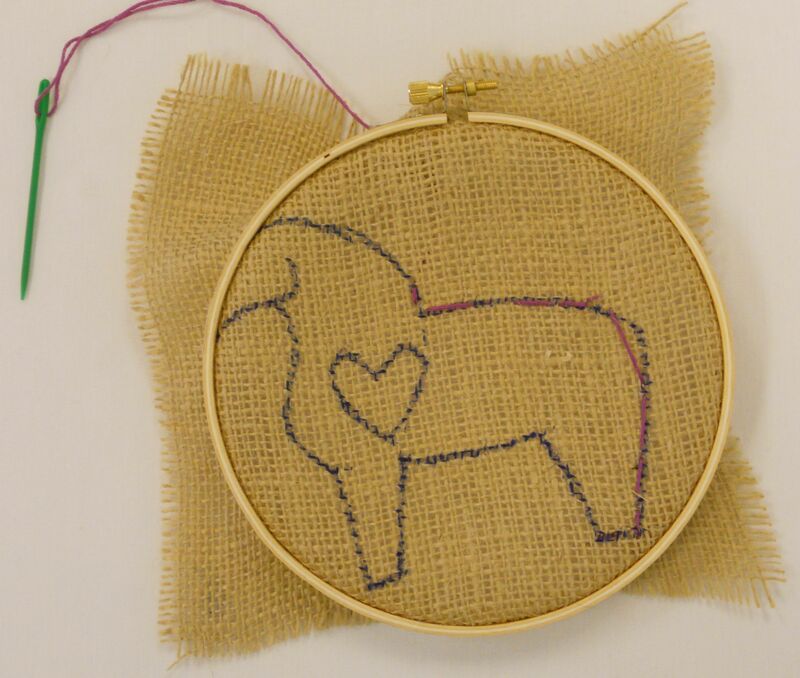 But this embroidery project I’m about to share is easy and rewarding. Here’s a little sample I whipped up ahead of time to show the ladies in my arts and crafts group. See, looks pretty good right? In a rustic, folk-art kind of way. They were all excited to make one of their own. The elderly ladies I work with LOVE embroidery projects, probably because they can easily relate to this traditionally feminine art form. Back in the day, I’m sure these ladies could knock out some amazing stitchery work. But dealing with arthritis, fading vision or visual field neglect, trembling hands, declining stamina, difficulty with cognitive processing or sequencing, loss of executive function in the brain… we have to tweak things a little bit to make embroidery work for their needs. The most important way to do this is by adapting the materials. I like to use small squares of burlap (cut to 6-8 inches), large plastic needles (for safety), and brightly colored yarn or embroidery thread (as a visual aid). I really like that this project draws upon what psychologists call pre-existing schemas; cognitive frameworks or concepts that helps organize and interpret information. 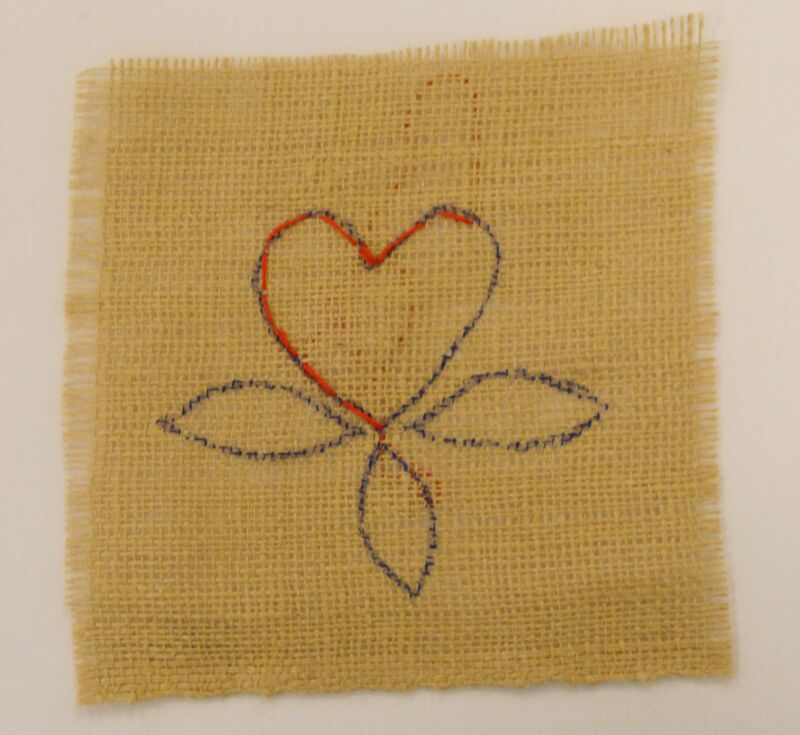 Stitching and embroidery are familiar past-times that relate to old memories, which are usually more intact for someone with memory-loss. 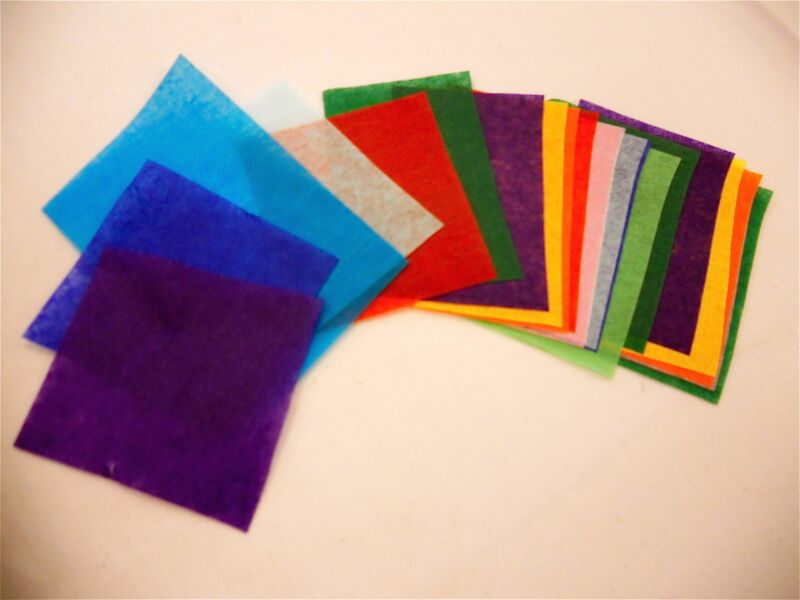 Even for someone who is very confused, if you put these materials in their hands, they will likely know what to do with them, though it may require a little prompting to get started. There’s also some research now that suggests “over-learned” skills may be more resilient to the brain atrophy that occurs in Alzheimer’s disease. These are the activities and hobbies that were pursued for years or decades before the onset of dementia. Activities like stitching, winding a ball of yarn, chopping up veggies, sorting buttons, dead-heading flowers in your garden, playing your favorite childhood song on the piano… all the ordinary everyday tasks or activities you’ve done your whole life which have become automatic. It’s as if those pathways in the brain have become well-worn tracks that can’t be completely erased. So we can use this information to our advantage in creating projects that will highlight familiar concepts and remaining abilities. 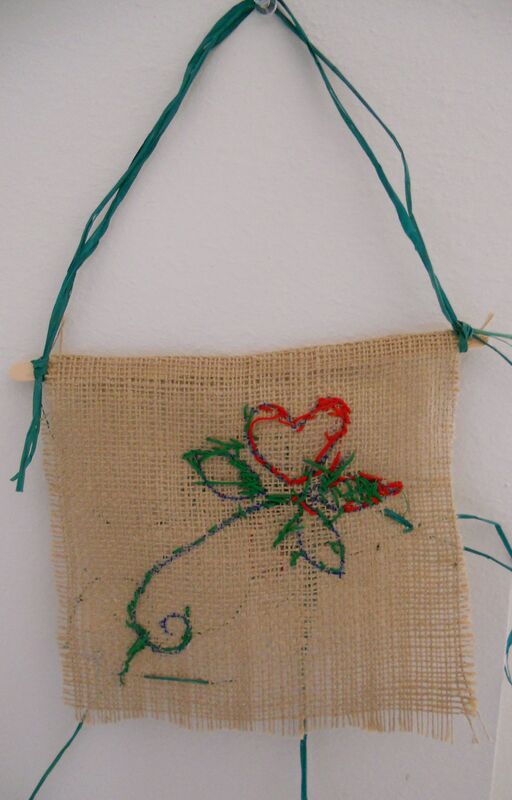 Cut up some burlap squares ahead of time, and draw a simple outline of a shape with a sharpie. Nothing too complicated. If you draw 2 or 3 samples on paper, some people will enjoy choosing their pattern, others will get overwhelmed by the choice. 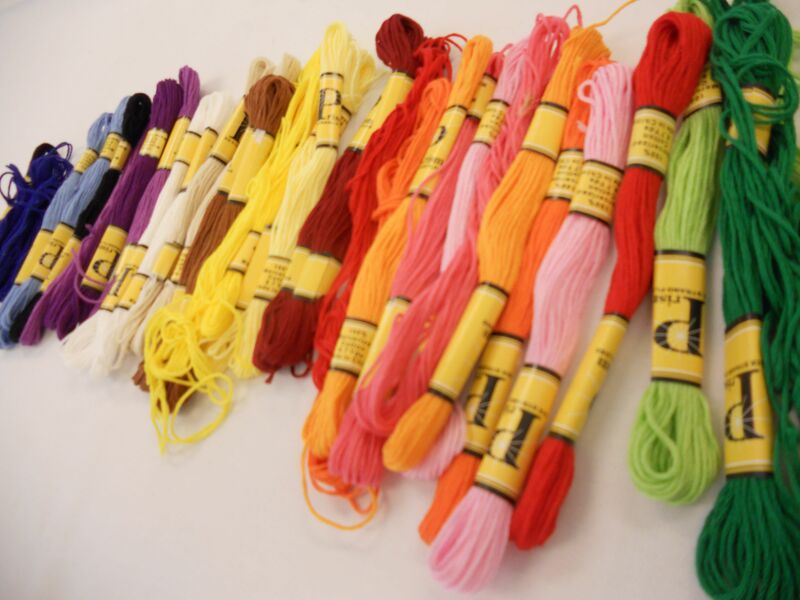 Thread the needle for them, knot the end, and demonstrate a few simple running stitches to get started. Showing them how to follow the line is a way of cueing someone, for those who are more visual than auditory in their processing of information. Some folks will take off and work independently, others will need help and encouragement when they get stuck. Some may need you to hold the burlap and coach them through the next step (literally serving as their third hand). Be patient and allow more than one session to complete the stitching. When you resume at the next session, you may need to remind some of the artists by talking about what they accomplished the week before. Sometimes people may not recognize their work as their own, even with some gentle cueing. Just let it go and don’t try to convince them of something that doesn’t feel real for them. This completed tapestry took 3 one-hour sessions for a woman who can only use one hand and has no vision on her left side. You can do a lot of things with the completed stitching. 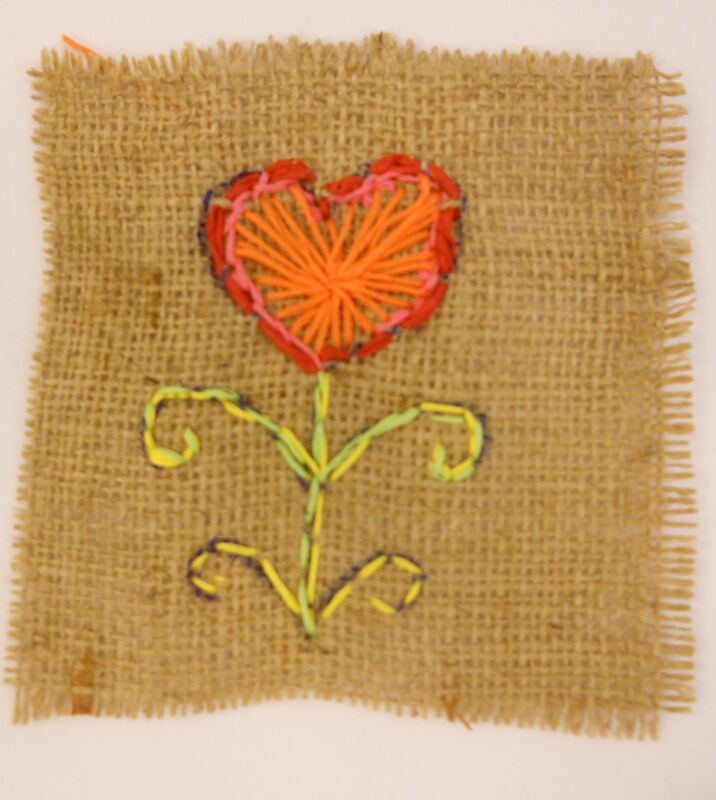 Sew or hot glue them onto a cloth bag or pillow, mount and frame them… In this case we hot-glued popsicle sticks to the back for support and tied on some raffia to make it a mini-tapestry. She was so happy with the result. And that was the best part of all. Welcome to Everblooming Art’s first ever blog posting! Woohoo! I suppose I should begin with a little story about how this blog came to be, by way of an introduction. I promise that future posts will be much less wordy, and much more arty! Back in 2007 when I graduated from Naropa University’s graduate program in Art Therapy, I had no idea I would ever end up working in a long-term care skilled nursing facility. I’d always felt an affinity for older folks, having spent a lot of time with grandparents and great-aunts, plus a few volunteer stints at nursing homes. As a kid and teen, older people always seemed easier to be around somehow. I probably enjoyed all the attention that the elderly often shower upon young people. So when I got my first real job out of grad school as an “activity coordinator” for a Dementia Unit at a nursing home, I was so excited to get to work enriching the lives of the residents and making a difference. Up until then, I had worked mostly with kids and young adults, so I read books in preparation and imagined amazing art therapy interventions I would implement. My very first “arts and crafts” group was a collage project. Simple right? No drawing or painting needed. Just cut and paste. 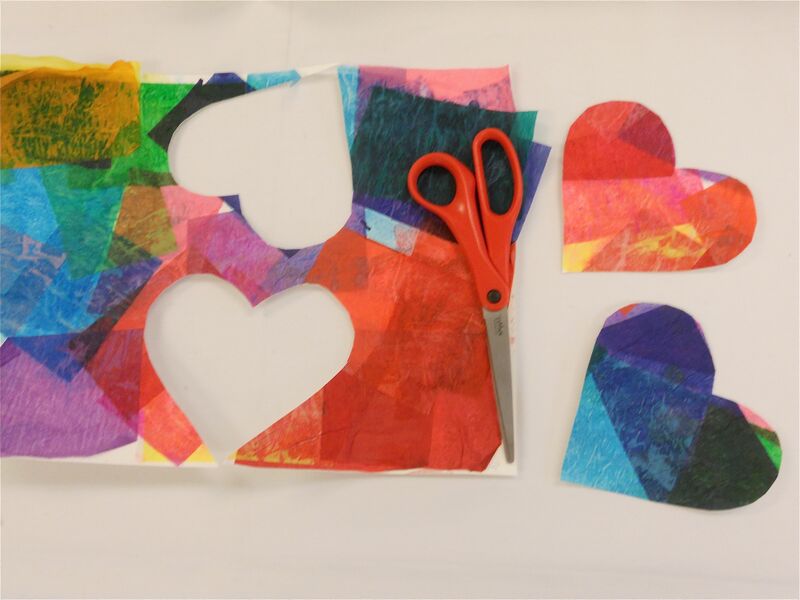 I handed out magazines, glue sticks, scissors, and big pieces of white paper, and suggested we “make a collage of our favorite things.” Just the kind of art therapy intervention to help us get to know each other. Oh, how naive I was! Those 5 gray-haired, wise-eyed people (mostly women) just stared at me. One chuckled and said “Oh Boy….” and then began whispering something to the lady next to her, who was busy murmuring sweetly to her baby doll. One lady, who spent most of her day walking laps through the halls, swung by the table and grabbed a glue stick which she carried for a few steps and then deposited on the nurse’s cart. The others just sat motionless, and as the panic began to set in, I also had my first introduction to the real education these wonderful people offered me. In short, they taught me how to slow down and enter their world. As I reflected on where I went wrong, I realized how a seemingly simple directive like “make a collage of your favorite things” is a very complex task (both cognitively and physically) for someone with dementia to execute. But I didn’t want to just give them a marker and start coloring in childish coloring pages, because I felt they were capable of much more. I just didn’t know the right way to support them in succeeding. So I began studying Montessori methods of how to break down complex tasks into simple concrete steps, I researched developmental theories of art production in children, how to assist by being their “third hand” when needed, how to develop age and person-appropriate art projects that would highlight strengths and remaining abilities. and the opportunity to connect with others in a social setting (relational). I’ve toyed with the idea of writing a book and have done a few presentations, supervised art therapy interns… but lately the idea of blogging seems like the ideal way to share with others (both caregivers and professionals in the field) about what I’ve learned along the way in doing art therapy with elders. So please check back as this blog grows, sign up for email updates… and I hope you find something here that is helpful in designing meaningful, fun art experiences for personal or professional use. Enter your email address to subscribe to 'Everblooming Art" and receive notifications of new posts by email.